Unlike many diets, the ketogenic diet has been in existence for more than 90 years. It was developed by a Mayo Clinic doctor as a dietary means for treating epilepsy in children until the introductions of medications to treat epilepsy in the 1940s. The keto diet is similar to the Atkins diet in that it is low-carbohydrate, but it also features high-fat foods (don’t worry, it’s the good kind of fat) and plenty of protein. The combination of these types of foods alters the way that energy is used by your body. Normally, when your body burns carbohydrates from food, your liver converts it to glucose, which then circulates around the body and helps fuel brain function. When you replace carbohydrates with fats, your body enters a metabolic state called ketosis. In this state, fats are converted into ketone bodies and fatty acids. The ketones are produced in the liver, and act as the main source of energy rather than the glucose your liver would normally produce from eating carbs. This means that when your body is in ketosis, it becomes very efficient at burning fat for energy for both your brain and your body. Standard ketogenic diet (SKD), which features 75% fat, 20% protein and 5% carbs. Cyclical ketogenic diet (CKD) where you go through a cycle of 5 ketogenic diet days that are followed by 2 high-carb days. Targeted ketogenic diet (TKD) that gives you the ability to add carbs to your diet around your workouts. High-protein ketogenic diet, which is similar to the SKD diet, but with a higher ratio of protein features 60% fat, 35% protein and 5% carbs. CKD and TKD diets are generally used by athletes or bodybuilders. As your body is burning fat, it is also experiences other important changes that are beneficial to your health. 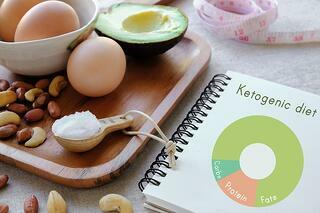 Ketogenic diets can greatly reduce your blood sugar and insulin levels. It is believed by many health professionals that low-carb diets, including the keto diet are powerful tools for battling some medical conditions, including diabetes, acne, obesity, and even cancer. It is recommended that anyone looking to start the ketogenic diet eases into it slowly. It will take your body some time to get into a state of ketosis and understand the new source it is drawing energy from now—fat instead of carbs. In most cases, it takes nearly two weeks for your body to adjust; additionally, an 8-week minimum is recommended for those starting the keto diet. Although the keto diet has numerous benefits for all types of athletes, it is especially effective for marathon runners. For athletes planning to train while on the ketogenic diet, it’s recommended that you cycle staying in ketosis for 5-6 days, and then have one day of carb intake. On your carb refeed days, recommended foods include white rice and root vegetables like red potatoes and sweet potatoes. A great tool to help you manage your diet and training is the MyFitnessPal app. It can be particularly helpful whether you’re tracking net or total carbs. Spoiler alert: there’s no wrong option when deciding whether to count net carbs or total carbs, it just depends on what you’re trying to achieve with the keto diet. A telltale sign that your body has been knocked out of ketosis is feeling sluggish or tired. Be sure to have a keto-friendly shake after workouts to help your body replenish the ketones that it’s drawing energy from and to stave off fatigue. The standard keto diet is 70% high fat, 25% protein, and 5% carbs, meaning your sugar and carb intake on this diet will be extremely low. On the keto diet, your body will essentially learn to live without sugar; the diet also helps wean you off of wheat-based foods, so it’s excellent if you are trying to minimize or eliminate gluten intake as well. In order to maintain ketosis, you’ll need to make sure your diet consists of keto-friendly foods. Some examples of keto diet-friendly foods include cacao powder, coconut oil and veggies like spinach, arugula, turnips and collards - basically any low glycemic index (GI) foods. The only recommended fruits are avocados and berries, since they are some of the lowest fruits in sugar content. We also offer customized meal plans and nutrition coaching that can assist you with meeting your keto diet goals. With any diet, including the ketogenic diet, it is always important to discuss your diet plans with your physician or nutritionist before beginning it. This will make sure the diet is appropriate for your individual health status and weight loss or performance goals.